Dem Club: Meet the NIC Young Dems! 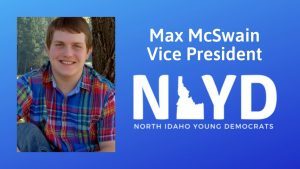 This Friday the Democratic Club welcomes​ Maxwell McSwain​​, Vice President of the North Idaho College Young Democrats. Max has lived in Coeur d’Alene since 2003 and is currently in his second year of college at NIC, where he is pursuing a degree in Political Science. Max is also involved with other school activities, such as the school’s magazine, The Sentinel, and the Secular Student Alliance. The North Idaho College Young Democrats club was reactivated earlier this fall. With help from the local Democrats, they were able to rebuild their club and engage some of their fellow students. On Friday, Max hopes to cover a range of topics. He plans on discussing the work the Young Democrats did for the recent midterm election, along with the club’s future goals and aspirations. He also plans to cover the club’s ideas for 2020 propositions, how they plan on engaging young voters, and a few local topics like Coeur d’Alene Watershed pollution problems and criminal justice reform in Idaho. Attention all Dem Club attendees: The KC Dem Community Outreach Committee is sponsoring a month-long food drive for the local food bank. Community Action Partnership in Coeur d’Alene provides food assistance for local families year round. As part of our effort to support local entities that help folks in need, we will collect donations of food during the whole month of December. Bring your donations of canned food each Friday to the Dem Club Lunch through December 28, or to the holiday party at the Global Kitchen on December 10, 6:30-8 pm. You may also contact Cathy Kraus at catk1994@gmail.com for questions or donations. If you’d rather make a cash donation, please give directly to CAP at 4144 Industrial Loop, Cd’A.